Surveying a decade of electoral shocks, coups d’état, demonstrations and democratic failings, ‘Hope to Nope: Graphics and Politics 2008-18’ (28 March–12 August 2018) at London’s Design Museum is an exploration of graphic design’s involvement in an escalating period of political unrest. Instead of a sequential narrative, the Design Museum and co-curators GraphicDesign& have organised the show into three sections. ‘Power’ is the most eclectic, embracing controversial campaigns (Brexit, Hillary Clinton), a ‘brandalised’ Volkswagen diesel poster and a board charting the evolution of social media. 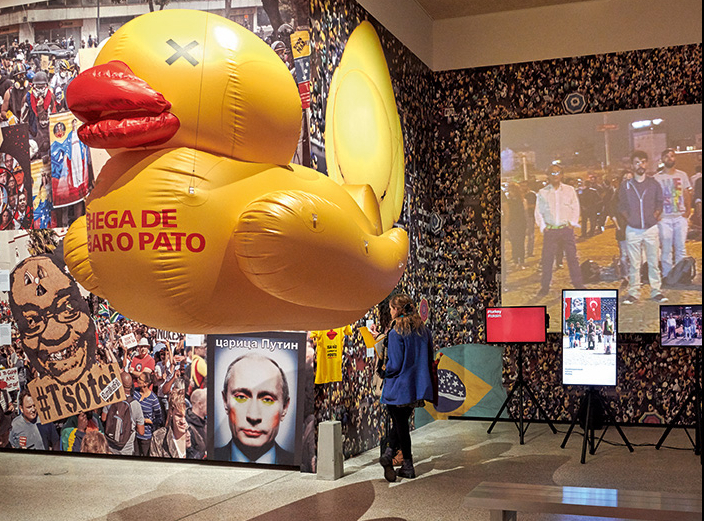 ‘Protest’ (above) has a ‘Gay Clown Putin’ poster; a giant rubber duck (a symbol against corruption in São Paulo); and placard-like screens looping videos of demonstrations. 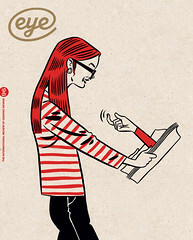 ‘Personality’, meanwhile, surveys the depiction of controversial characters such as British Labour leader Jeremy Corbyn (The Corbyn Comic Book) and the current US President, including Edel Rodriguez’s splenetic Donald Trump caricatures for Der Spiegel and Time. Though ‘Hope to Nope’ is timely, it is hard for such an exhibition to keep pace with events. As social media’s ‘liberal’ image crumbles (in the light of the Cambridge Analytica revelations), it reveals an undertone that these curated objects can only tease: some of the most powerful ‘political designs’ are those we rarely consider political at all. In the first space, a quotation from designer Mike Monteiro states: ‘Design is always political.’ Yet, despite the lucidity of the accompanying catalogue and an impressive programme of related talks, the exhibition rarely addresses this sentiment. While we see how design penetrates politics, ‘Hope to Nope’ leaves out the way politics pervades the everyday production of graphic design. Above: Benjamin Westoby for the Design Museum.